Even though she couldn’t see it, she could feel it through the walls that separated her from it. Embarrassment radiated from it, sending a wave of warmth through the wall and down into the floor boards, seeping into her room and then up into her cheeks. She decided: I’m just going to take it down. She defiantly stood up from her bed and walked through the jack-and-jill bathroom to the guest room where the source of her flushed cheeks and anxiety was. She stared at it. She winced. It was her chubby, 7-year-old face staring back at her. 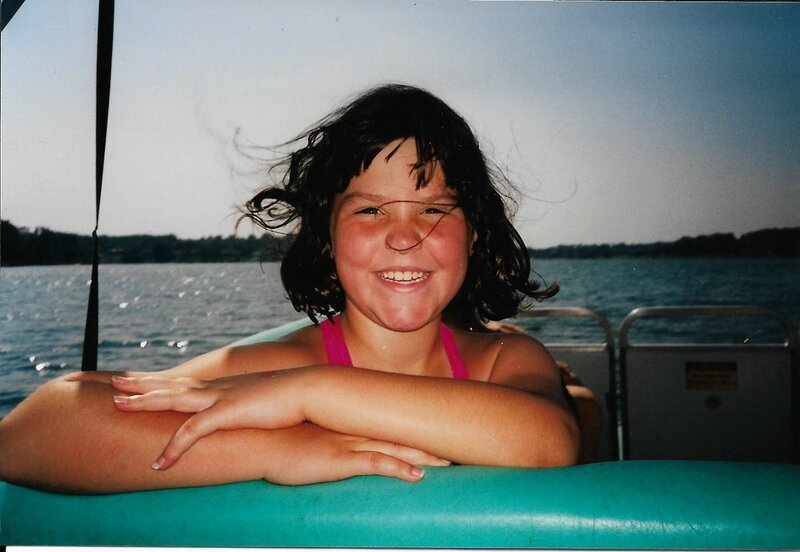 Her dad had just hung a severely close-up photograph of her on a boat from a few summers back. Her bloated cheeks looked stuffed into the frame, her knotted hair practically flying off the glossy print. She was mortified. She took the picture down, quickly and quietly stashing it away in the closet. Her dad would never know, he almost never went in the guest room (except, apparently, for when he decided to frame and hang embarrassing photos of her). She shut the closet door and walked back into her room, breathing a sigh of relief. While the pre-teen deemed the closet an appropriate place for the framed memory, the 7-year-old in the photo would have said otherwise. In fact, when the photo was taken, she was probably actively posing for what she very likely viewed to be a photo shoot. Why? Because she saw no flaws in herself. She felt she was so central to the scene that she grew up calling home video footage “Stephie Videos” (even after her little sister was born). She thought she could (and did) beat all the boys in her elementary school class at arm wrestling. She was convinced she was the next pop star, the next great movie director, the next inventor, the next Picasso, and oh—she was going to be the first female president. But then she started growing up. And self-awareness began to appear every time she looked in the mirror, poking its head out over her shoulder a little further with every passing glance. It was partially a good thing: who would want to hang out with a girl as conceited as the “top model” on the boat? But it was also a crippling thing: the girl who had sung the Star Spangled Banner at her third grade Thanksgiving play in front of the whole gymnasium was now shaking as she held flashcards for a presentation in front of her seventh grade history class. The girl who was proud of her big-boned build and how it surged her through the water to nationally ranking swim times now thought her muscles looked a little too big. The girl who had always raised her hand to try something new now felt a rush of blood to her cheeks whenever she got called on in class. Confidence is anything but linear in this way. When you’re a kid, you’re willing to do and try anything because you’re convinced you’ll be great at it—life hasn’t proved otherwise. But once life has knocked you down a few times, you approach opportunities and challenges with more trepidation. It’s time to put pen (or, for that matter, crayon!) to paper as I begin a new chapter this month. I’m starting a new job in a few weeks and am getting ready to tap into my little-kid self. I can feel the smile of the chubby girl hanging back up on the guest room wall (my dad always did sneak back in to re-hang it) in my parents' New Jersey home. I can feel it radiating confidence, sending a wave of warmth through the wall and down into the floor boards, seeping across state lines and up into my heart.